The inspirational and powerful story of Patti, one of America's most beloved musical icons. Born Clara Ann Fowler in Claremore, Oklahoma on November 8, 1927 Patti Page's career spanned more than six decades as she became a living legend and sold more than 100 million records. 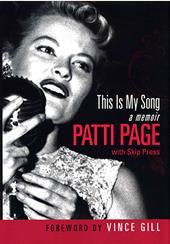 In This Is My Song, Page tells her extraordinary story firsthand and takes readers on the moving and heartwarming journey from her poor upbringing to her greatest challenges and successes as an artist and as a woman. This Is My Song opens with Page at the pinnacle of her career, standing on stage at Carnegie Hall and planning for a sell-out show. As she reflects back on her life and career, Patti shares her most personal thoughts, fears, and triumphs as she goes from a small-town girl from Oklahoma to one of the biggest selling female recording artists in history. Filled with anecdotes and personal stories, This Is My Song is a true masterpiece and a rare and unedited look in to the life of one of the most inspirational female artists of our time.